This ticket is valid for one admission to Big Splash Water Park for people 48 inches and taller. It includes all day unlimited use of the heated wave pool, The Pipe Slides, The Cyclone, Torpedo Bay, Boomerango, Full Throttle, Spray 'N' Play (our water park for kids), and the FunworX 3-level play structure. Valid for the 2019 operating season only. See website for dates and hours of operations. 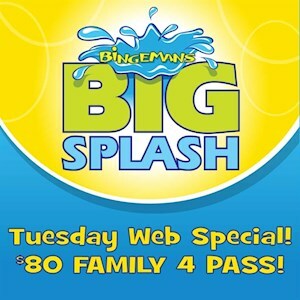 This ticket is valid for one admission to Big Splash Water Park for people under 48 inches. It includes all day unlimited use of the heated wave pool, Spray 'N' Play (our water park for kids), and the FunworX 3-level play structure. Please note The Pipe Slides, The Cyclone, Torpedo Bay, Boomerango, and Full Throttle require a minimum height of 48", therefore this ticket does not include access to those slides. Valid for the 2019 season only. Please see website for operating dates and times. This ticket is valid for one admission to Big Splash Water Park for seniors (65 years or older). It includes all day unlimited use of the heated wave pool, The Pipe slides, The Cyclone, Torpedo Bay, Boomerango, Full Throttle, Spray 'N' Play (our water park for kids), and the FunworX 3-level play structure. Valid for 2019 operating season only. See website for dates and hours of operations. 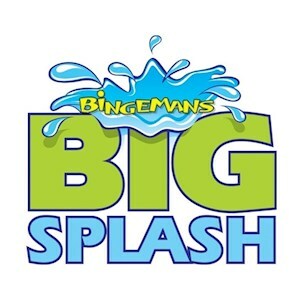 This ticket is valid for one admission to Big Splash after 4pm on any day during the 2019 operating season. This ticket is valid for Big Splash water park only and does not include access to FunworX 3-level play structure, outdoor mini golf, or Ropes Course. 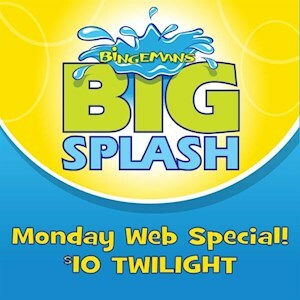 SAVE 30% on Twilight Mondays! 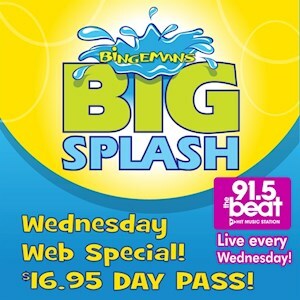 This ticket is valid for one admission to Big Splash after 4pm on MONDAYS ONLY. This ticket is valid for Big Splash water park only and does not include access to FunworX 3-level play structure, or Ropes Course. This Web Special is AVAILABLE ONLINE ONLY and cannot be purchased onsite. Please take this ticket directly to Wave Pool Door for redemption. Valid for the 2019 operating season only. See website for dates and hours of operations. BUY ONE, GET ONE FREE! This ticket is valid for two admissions to Big Splash Water Park on THURSDAYS ONLY. It includes all day unlimited use of the heated wave pool, Spray 'N' Play (our water park for kids), The Pipe slides*, The Cyclone*, Torpedo Bay*, Boomerango* and Full Throttle*, and the FunworX 3-level play structure. This Web Special is available ONLINE ONLY and cannot be purchased onsite. Both Admissions must be redeemed at the same time. (*must be 48 inches and over. Guests will be measured upon arrival) Valid during 2019 operating season only. See website for dates and hours of operations.